Loc8 comes with built-in notification system that sends out standard messages through emails and in-app notifications on occurrence of certain events, such as new job creation and completion, quote rejection or acceptance etc. to people who are responsible or participating in the ongoing work. You can edit the standard messages to align the language used in your business and also create you own messages under Settings -> Message Templates. 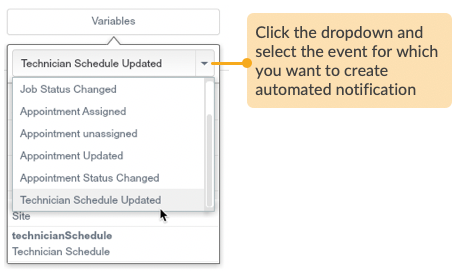 Once you have the messages ready, you need to do a one-time configuration under Settings -> Automation to define the events for which the messages must be triggered and to whom they should be sent. This article shows you the step-by-step procedure for automating your notifications. STEP 1 Go to the Settings page to access Message Templates. STEP 2 Open the Message Templates. 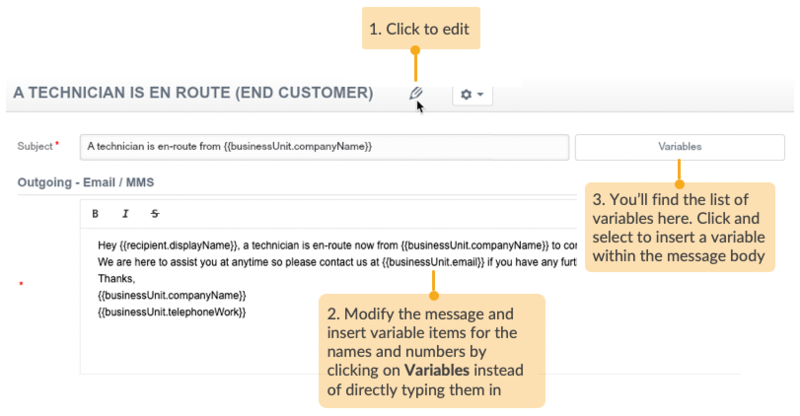 STEP 3 Select one of the entity types and select the required message template. Edit the subject and body of the message template. To display dynamic values such as names and numbers, you must use variables that are like placeholders indicating the type of value it will display in the message when it goes live. 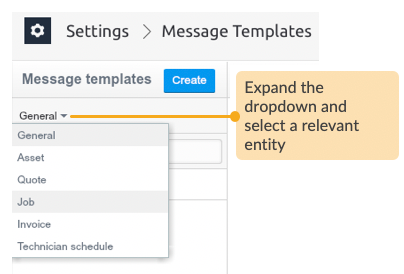 Check out how you can add attributes/fields from the Variables dropdown list under the section Add dynamic values to your message further down in this article. This is how you will customise an existing message template. Open the message template creation wizard. 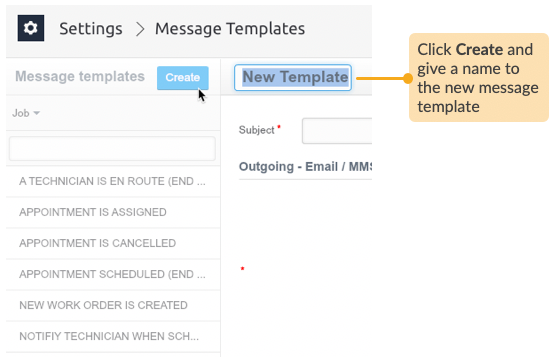 Fill in the details of the new message template. 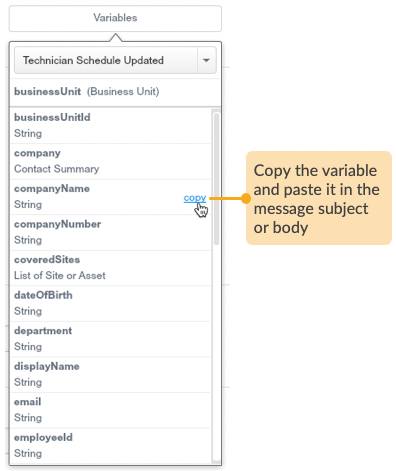 From the message template, click the Variables button to access the relevant attributes and fields that are displayed based on the type of event you have selected. 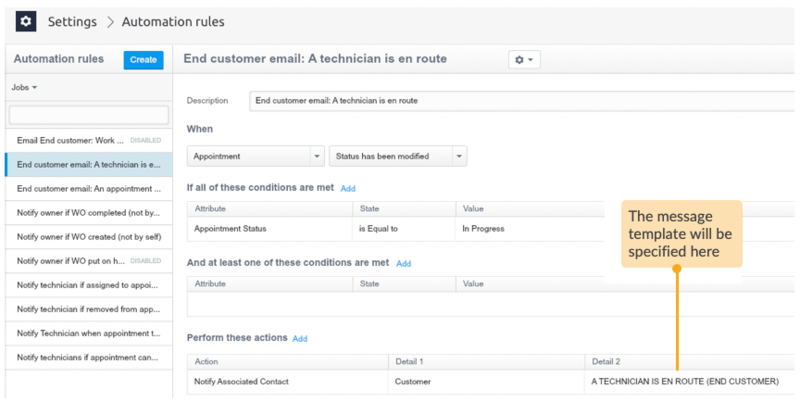 You will configure automation rules to let Loc8 know what type of event should the notifications be triggered, the relevant message template to structure the notification, the conditions that must be met for the notification to be sent out and what actions should the automation rule finally perform, for example, a automation rule is set up to notify the customer contact on change of technician appointments. STEP 1 Go to the Settings page to access Automation Rules. 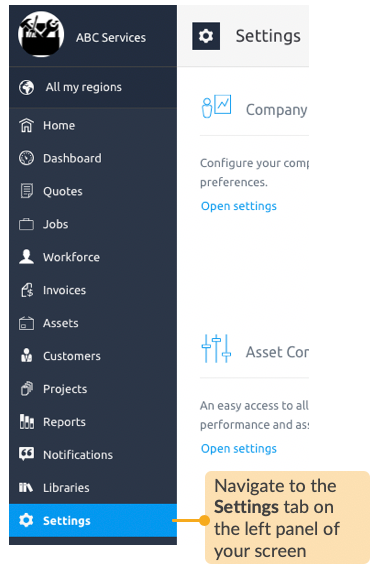 And, open the Automation Rules page. Select one of the entity types (i.e. Jobs, Assets, etc. from the dropdown under Message templates) and choose from the list of possible automation rules. 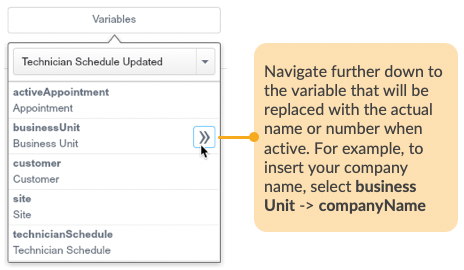 If you are directly using one of the standard message templates or you've customised a standard message template, then you will find a corresponding automation rule already available under the same entity type. For example, the message template A TECHNICIAN IS EN ROUTE (END CUSTOMER) exists under Job, and you will find its corresponding automation rule End customer email: A technician is en route, which uses the message template, is also under Jobs. You can also add additional conditions or actions on top of the default rules using the Add button and save the changes once done. This completes the necessary steps required to automate notifications.